Heather Lloyd's training facility, Tails of Valor, Paws of Honor, is dedicated to training dogs to become service companions to disabled military veterans. There are two locations: the training center and high-end kennel in Springfield Township, Pennsylvania, called the 'resort', and a Coopersburg storefront called Critter Corral, for food and grooming. In Lloyd's own words: "We teach them so that together they can go out into society as a successful team. Heather Lloyd brings to this organization nearly twenty years experience in caring for dogs via her business, Critter Corral Inc. She trains rescued dogs to become life partners with veterans who suffer from physical disabilities, traumatic brain injuries (TBI) and post-traumatic stress disorder (PTSD). These animals perform a noble job helping veterans reintegrate into society and improve both their quality of life and their familial relationships. (See my article about Sergeant Rocky and Officer Brown). How are these dog trained? Lloyd uses mixed breeds and Labrador, usually between the ages of 8 and 14 weeks of age, because of their intelligence and ability to concentrate. At this early age, which is known as their "sponge period," it is easier for them to learn and absorb the many things they will need to know as a qualifying therapy dog and companion. The word, 'rescue' applies to both the dogs and the veterans whose lives revolve around this wonderful organization. More than a few of the volunteers and trainers have been homeless and Lloyd's current program manager, George Mutter of Quakertown, was once a homeless Army veteran. 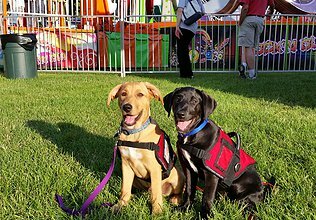 How do veterans qualify for these special dogs? There are specific benchmarks that can predict 100 percent success in placing veterans with service dogs. (See my article on Lucca: A Miitary Dog For All Seasons).Veterans must provide discharge papers and proof of disabilities. Those with physical challenges must have completed inpatient rehabilitation or be a year removed from their injury. 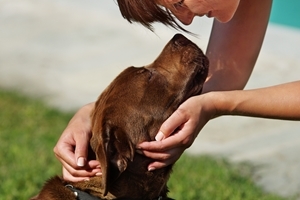 For psychiatric disabilities, they must be in treatment for at least six months and present an evaluation stating they are capable of having a positive relationship with a dog. Other stipulations include: a strong support system and for those who live far from the facility, the ability to travel in order to attend intensive two-week training sessions. The service is free for qualifying veterans, and via the program and Verus pet food company, the dogs are inoculated and receive free food for life. Lloyd's business supports the program as well as significant donations, including $3,000 from the Coopersburg Fire Company. She is always seeking more money, as her ultimate goal is to expand the current program into a full-scale mental health facility for veterans. For Heather Lloyd, it's all about showing appreciation for those who have served. In her own words: To be able to instill a change in someone else's life inspires me." And for all others, it should be about how she inspires us to do something good for those who have so bravely served this great nation we call home.